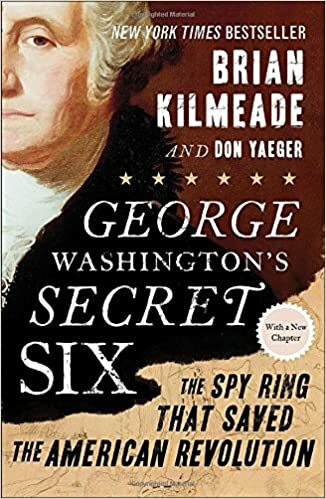 For Christmas, my wife gave me a copy of Brian Kilmeade and Don Yaeger’s George Washington’s Secret Six: The Spy Ring That Saved the American Revolution. Like thousands of other people, we have been enjoying AMC’s Turn, which is a television series based on the subject-matter of the book. Watching the show sparked a renewed interest in the American Revolution, prompting me to begin reading histories of that time period. The book is a short read, and I recommend it to anyone who watches the show and wants a history of the spy ring. Even if you don’t watch the show, I think you would find the story of the spy ring interesting. Here were a few people trying to provide information about British troop movements to Washington. Their lives were in danger – Nathan Hale had been killed in Manhattan for spying in the months preceding the formation of this spy ring – and they were amateurs. The pressures they would have been under would have been tremendous. One of the members was forced to provide quarters to the British troops, and other members served soldiers daily during their day job. They had to find ways of smuggling information from under the nose of thousands of British soldiers, and they developed secret codes and used invisible ink to do so. Interestingly, at the end of the book the authors report that they learned that the CIA used the history of the spy ring to introduce people to espionage methods (215). To complicate matters, the British forces set up their own spy ring, partly to discover the American spys around Manhattan. The most famous part of the American Revolution that the spy ring affected involved Benedict Arnold. The spy ring did not uncover the plot that Arnold was hatching, but their information helped the Americans put the pieces together when they captured the British epionage leader who had letters from Benedict Arnold on him. As I said, I do recommend this book. But there were a few things that bothered me. First, the way that Turn altered the story. Okay. I know that htis isn’t the authors’ fault. But it did impact my enjoyment of the book. I wasn’t frustrated at Kilmeade and Yaeger. I was simply frustrated that the writers of Turn felt the need to alter the story the way they did. For example, they switched the storylines of Abraham Woodhull and Robert Townsend. Since I went into the book assuming that Turn was more accurate than it really was (someone told me it was very historically accurate), I didn’t expect this. The cognitive dissonance confused me at first. I did get over this. And, again, this is not the authors’ fault and should not keep you from reading the book. It is something to be aware of, though, before you start the book. I understand why the authors chose to do this. For the average person, it probably makes the book more engaging. But I usually don’t like this in history books. Why? It is simply that I don’t know what was a historical statement and what was fictionalized. Since the authors used “acutal phrases used by the speaker,” this makes it even more difficult. Part of the dialogue is historical; part isn’t. How am I supposed to tell them apart? I would like to know what was really said by those involved. I kept wondering throughout the book if Washington really thought what was being expressed in the dialogue, or was it part of the authors’ imagination. It’s not even that I want to know if he used the exact phrase in the dialogue, but I found myself wondering if Washington even had the sentiment or thought expressed in a particular piece of dialogue. Third, I would have liked for the book to be more detailed. The authors don’t pretend to give a comprehensive history of the spy ring, so this doesn’t hurt my overall recommendation for the book. Nor do I think they failed in their task. I just have a preference for historical details. But despite the brevity of the book and the lack of historical detail I prefer, it still informed me about events during the Revolutionary War of which I was previously unaware. The war, as most wars are, had to be truly terrifying to the women of the Colonies. I have never heard of John Champe before, but his mission is one of the most interesting of the American Revolution. John Champe volunteered for a secret mission, which he learned about only after being chosen. Benedict Arnold had recently betrayed the Americans, and Washington wanted to punish Arnold. So Champe’s mission was to pose as a deserter and traitor from the American side to the British. The hope was that he would eventually have the chance to meet Arnold. In doing so, he could study his behavior and determine the best time to kidnap, with the help of others, Arnold to take him back to territory controlled by the Americans. Arnold would then be put on trial. It worked for a while. Champe showed up on the British side and eventually convinced them that he was a traitor. He met Benedict Arnold and was even put under Arnold’s command. He formed a plan to kidnap Arnold, but before he could carry it out, the British force he’d been assigned to was shipped out on a campaign. I have never heard of Champe’s mission, but it is perhaps the most daring and interesting of the American Revolution. So I do think the book is worth reading, particularly if you are interested in the American Revolution, or even just enjoy watching Turn. My only complaints against it can be seen as positives: it is a quick read unencumbered by tons of historical detail, and so it holds one’s interest pretty well. Just start reading the book expecting it to be what it’s trying to be, and I think you’ll enjoy it.